Thorarinsdottir, Kristin Anna Arason, Sigurjon Sigurgisladottir, Sjofn Gunnlaugsson, Valur N. Johannsdottir, Jonina and Tornberg, Eva 2011. The effects of salt-curing and salting procedures on the microstructure of cod (Gadus morhua) muscle. Food Chemistry, Vol. 126, Issue. 1, p. 109. Nguyen, Minh Van Thorarinsdottir, Kristin Anna Gudmundsdottir, Agusta Thorkelsson, Gudjon and Arason, Sigurjon 2011. The effects of salt concentration on conformational changes in cod (Gadus morhua) proteins during brine salting. Food Chemistry, Vol. 125, Issue. 3, p. 1013. Aliño, M. Grau, R. Fernández-Sánchez, A. Arnold, A. and Barat, J.M. 2010. Influence of brine concentration on swelling pressure of pork meat throughout salting. Meat Science, Vol. 86, Issue. 3, p. 600. Barat, J.M. Aliño, M. Fuentes, A. Grau, R. and Romero, J.B. 2009. Measurement of swelling pressure in pork meat brining. Journal of Food Engineering, Vol. 93, Issue. 1, p. 108. Vestergaard, Christian Risum, Jørgen and Adler-Nissen, Jens 2005. 23Na-MRI quantification of sodium and water mobility in pork during brine curing. Meat Science, Vol. 69, Issue. 4, p. 663. GREASER, M.L. 1986. Muscle As Food. p. 37. MELO, T. S. BLUMER, T. N. SWAISGOOD, H. E. and MONROE, R. J. 1974. CATHEPTIC ENZYME ACTIVITY IN AGED COUNTRY-STYLE HAMS AS INFLUENCED BY PRE-CURING TREATMENT. Journal of Food Science, Vol. 39, Issue. 3, p. 511. Eskin, N.A.M. Henderson, H.M. and Townsend, R.J. 1971. Biochemistry of Foods. p. 153. Wood, F. W. 1966. 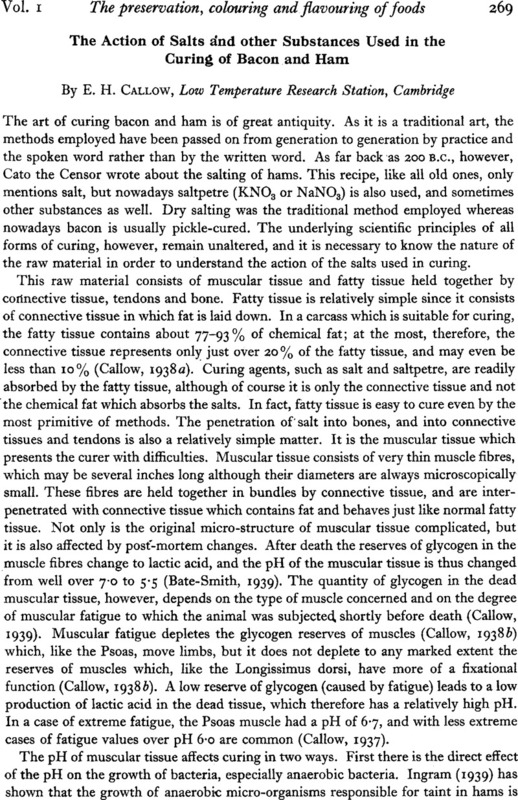 The diffusion of salt in pork muscle and fat tissue. Journal of the Science of Food and Agriculture, Vol. 17, Issue. 3, p. 138. BARBE, CHARLES D. MANDIGO, R. W. and HENRICKSON, R. L. 1966. Bacterial Flora Associated with Rapid-Processed Ham. Journal of Food Science, Vol. 31, Issue. 6, p. 988. Hamm, Reiner 1961. Advances in Food Research Volume 10. Vol. 10, Issue. , p. 355. Körmendy, L. and Gantner, Gy. 1960. Correlations between the pH value of meat and the diffusion of salt. Journal of the Science of Food and Agriculture, Vol. 11, Issue. 7, p. 377. Callow, E. H. 1956. The technology of bacon-curing. Journal of the Science of Food and Agriculture, Vol. 7, Issue. 3, p. 173. Hornsey, H. C. and Mallows, J. H. 1954. Beef-curing brines. I.—Bacterial and chemical changes occurring in rapidly developing, short-life brines. Journal of the Science of Food and Agriculture, Vol. 5, Issue. 12, p. 573. Watts, Betty M. 1954. Advances in Food Research Volume 5. Vol. 5, Issue. , p. 1. Gibbons, N.E. 1953. Advances in Food Research Volume 4. Vol. 4, Issue. , p. 1. Ingram, M. 1949. Salty flavour in bacon. Journal of the Society of Chemical Industry, Vol. 68, Issue. 12, p. 356. Banfield, F. H. & Callow, E. H. (1934). Rep. Food Invest. Bd, Lond., p. 72. Banfield, F. H. & Callow, E. H. (1935). J. Soc. chem. Ind., Lond., 54, 413 T.
Bate-Smith, E. C. (1939). J. Physiol. 96, 176. Brooks, J. (1937). Proc. roy. Soc. B, 123, 368. Brooks, J., Haines, R. B., Moran, T. & Pace, J. (1940). Spec. Rep. Food Invest. Bd, Lond., no. 49. Callow, E. H. (1927 a). Rep. Food Invest. Bd, Lond., p. 17. Callow, E. H. (1927 b). Analyst, 52, 391. Callow, E. H. (1931). Rep. Food Invest. Bd, Lond., p. 144. Callow, E. H. (1932). Rep. Food Invest. Bd, Lond., p. 101. Callow, E. H. (1933). Rep. Food Invest. Bd, Lond., p. 97. Callow, E. H. (1934). Rep. Food Invest. Bd, Lond., p. 65. Callow, E. H. (1936). Rep. Food Invest. Bd, Lond., p. 75. Callow, E. H. (1937). Rep. Food Invest. Bd, Lond., p. 46. Callow, E. H. (1938 a). Rep. Food Invest. Bd, Lond., p. 45. Callow, E. H. (1938 b). Rep. Food Invest. Bd, Lond., p. 53. Callow, E. H. (1938 c). Rep. Food Invest. Bd, Lond., p. 55. Callow, E. H. (1939). In the Press. Callow, E. H. & Moran, T. (1938). J. R. sanit. Inst. 58, 157. Ingram, M. (1934). Rep. Food Invest. Bd, Lond., p. 77. Ingram, M. (1939). In the Press. Ingram, M. (1947). Personal communication. Lea, C. H. (1933). J. Soc. chem. Ind., Lond., 52, 57 T.
Pettet, A. E. J. & Lane, F. G. (1940). J. Soc. chem. Ind., Lond., 59, 114.